Carol Adams’ work is concerned with the role of accounting and reporting in the relationships between business, society and the environment. For over two decades she has sought to advance practice and policy with respect to integrating sustainability considerations into organisations through applied research, leadership, standard setting, advisory work and educating the next generation of business leaders. She has been involved in various global corporate reporting initiatives and is currently a member of the Stakeholder Council of the Global Reporting Initiative and a member of the Capitals Technical Collaboration Group for the International Integrated Reporting Council. She served as a Director and Council Member of AccountAbility and was involved in the development of the first AA1000 Framework. She is a member of the ACCA’s Global Forum on Sustainability, the Institute of Chartered Accountant’s of Scotland’s (ICAS) Sustainability Committee and the Climate Disclosure Standards Board’s Technical Working Group. Carol consults to multinational corporations and other organisations on corporate reporting. Recent assignments have included work with Royal Bank of Scotland and Dairy Australia on sustainability reporting and Cbus Superannuation fund on integrated reporting. She has also led the development of award winning sustainability reports, management and governance processes (details below). Carol has served on a number of Boards in the finance, education and not-for-profit sectors. She has also served as a member of the Sustainability Advisory Board for Fuji Xerox Australia and Sustainability Leadership Advisor to the Commonwealth Education Trust. She is a Fellow of the Australian Institute of Company Directors (FAICD) and has passed the Company Directors and the Mastering the Boardroom courses having won an Aust. Govt. scholarship for the latter. 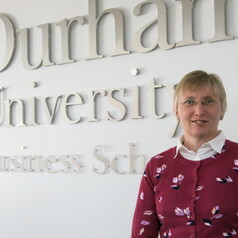 Carol is Professor of Accounting at Durham University Business School in the UK. A number of her articles in academic accounting journals of international standing are ranked in the top 20 most cited articles in the journal in which they are published and her work has been in the news. She is founding editor of the Sustainability Accounting, Management and Policy Journal. Her work has been cited over 7,000 times. She also writes for business media and professional journals. Carol has a financial audit background qualifying as a member of ICAS (Institute of Chartered Accountants of Scotland) with KPMG. She holds an MSc in Accounting and Finance from the London School of Economics and a PhD in International Corporate Reporting from the University of Glasgow. She has held senior management positions in Universities including as Head of School, Faculty Dean and Pro Vice-Chancellor (Sustainability) and has previously held Professor of Accounting positions at Monash University and the University of Glasgow.